This was my first Neil Gaiman novel! I know, insane that I haven’t read any of his works yet! I have Good Omens and American Gods on my list to read eventually but for now, I will have to suffice with just one novel. And let me tell you, I’m so happy I picked this one! I really enjoyed Gaiman’s style of writing and I was totally enamoured with the way he described the faerie world and I loved every single creature in it. I do have a dirty secret to admit. I saw the movie first, I didn’t know it was a book or who Neil Gaiman was at the time, I had been reading mostly The Mortal Instrument series, the Twilight series [where I threw the final book against the wall, but that’s a story for another time] and Harry Potter and the Deathly Hallows and of course, graduating H.S. 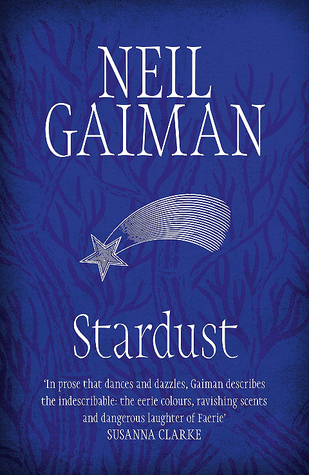 and starting Uni, so, I was a bit busy to notice the fact that Stardust was a novel when I first saw the film in 2007 [I told you all I was old]. I love both the book and the movie. I thought the movie was a nice adaptation of it, and quite frankly I usually enjoy the movie versions of things…I can honestly say there’s only a handful of movie adaptations where I’m like ready to fight them on it. Neil Gaiman does a great job with faerie tales from what I hear and this proved it to be true thus far at least in this novel for me. I cheered Tristan on as much as I did in the movie and I think I did like the book’s final scene between the Witch Queen and the Star better than the movie if I were going to nitpick anything. I don’t want to give too much away and I really think the book speaks for itself, Tristan Thorn goes off to find a star as the woman he loves asks of him, and along the way he explores the faerie world and learns to become part of something that’s more than the town of Wall. I also read a version which gave a cute tiny short story about a girl and Wall and I hope someday Neil Gaiman decides to give us more from Wall and Tristan Thorn, I know he had plans too but, I think we all know this is one BUSY man! Truth be told I also would have no complaints if he ever decided to write a book solely about the Witch’s servant [not giving anything away for those who haven’t read it, so sorry for using such vague terms for both those who haven’t read it and those who have]. Yet another five cups of coffee from me, and I can’t wait to read my next Neil Gaiman novel…but…*Stares at her NetGalley list* Well, it could be a while! 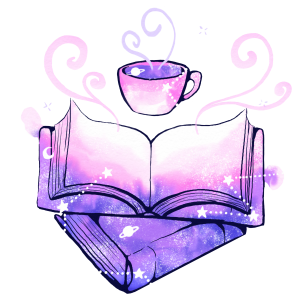 Tomorrow, expect mini-reviews for The Fourth Courier and Queen of Sea and Stars both who I have major bones to pick with lol.